'Secret Rendezvous' (Heather Pryor, R. 2010) Seedling 50/00-G. LA, 40" (102 cm), Early bloom. Standards pastel pink, darker pink blush at edges, fine lime-green veined signals; style arms pale lemon, pink blush and tips, occasional small lemon horns; Falls medium cerise-pink, slightly darker edges, raised lime steeple signal with maroon surround; ruffled, triangular form; slight fragrance. 'Our Dorothy' X 'Renée Fleming'. 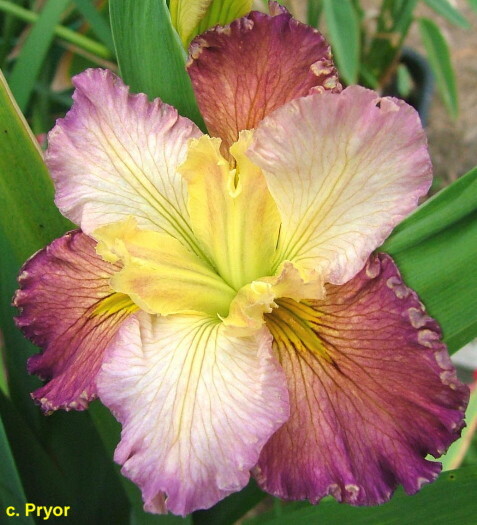 Iris City 2010.